Selecting windows for your home can be a dicey affair — unless you know what how to decipher the labels that you see on new windows. What do all of those numbers and phrases on the window labels mean? It’s important that you understand them, so you can compare different manufacturers’ windows when you are shopping for your project. The National Fenestration Rating Council (NFRC) is the organization that provides a form of standardization for all new windows sold in the U.S. and provides the labeling system. The NFRC was created by the window, door and skylight industries, with the goal of providing standardized information for consumers. Don’t worry — it’s a public and private non-profit organization, so it’s legit. What the heck does fenestration mean, you ask? Fenestration is the term used to describe an opening in a building’s envelope that includes windows, doors, and skylights. The NFRC has been using consumer-friendly labels to rate windows, doors and skylights since 1993. The label is for comparing energy efficiency in an apples-to-apples environment. Many building codes now require the NFRC label, which is great. It’s good for consumers and the industry alike. Let’s start with the basics and take it from there. U-factor measures how well a window prevents heat transfer. The lower the U-factor, the better a window’s resistance to heat flow. It also means it has a better insulating value. A window with a U-factor of 0.25 has an R-value of 4 (1/.25=4). Solar Heat Gain Coefficient (SHGC) determines how well a window blocks heat from sunlight. SHGC is measured from 0 to 1 and it’s the fraction of incident solar radiation through a window. The lower the number, the less solar heat transmits into the home. Visible Transmittance (VT) is how much light comes through a window or skylight. It’s also measured between 0 and 1. The lower the number means the lesser amount of visible light shines through. If a window has a VT of 0.85, that means that 85% of the light will transmit through the window. Air Leakage (AL) measures air infiltration through cracks in the frame, sash, and the window as a whole. The rating is shown as equivalent cubic feet of air that passes through a square foot of window. The lower the number, the lower amount of air that passes through. Condensation Resistance (CR) is the ability of the window to resist the formation of condensation on the inside of the window during colder weather. CR is measured between 0 and 100 with the higher rating indicating that it’s better at resisting condensation forming on the interior of the window. On a window label, you will also find the manufacturer name, product name and the type of window it is. If I were shopping for new windows, I would simply snap a photo of the label up close and another photo of the whole window, then move on to another window. Looking at the photos from the comfort of your home will help you compare windows, by noting the similarities and differences. As you may have already guessed, Energy Star has gotten involved — which is a good thing. 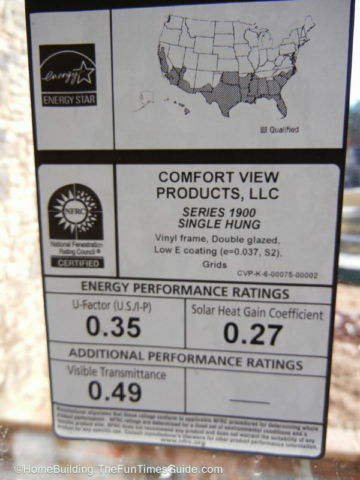 Energy Star also has a window label of their own that gives the consumer plain information based upon the U.S. Dept. of Energy performance specs by region. This basically means that a different set of standards are required for northern climates vs. southern climates. Low-E literally means low-emissive (or low emissivity). Low-E coatings are microscopic, metal layers that are applied to the window to block heat loss. However, it’s not the same as tinted glass. Look for low-E coated windows — which most are these days. Family Handyman: Should You Repair Or Replace Windows?